Hello Friends! FREE roller skating party that Don and Debi - of Sinclair Pump & Electric - are hosting - April 17, 6-8 PM. Debi says, "I know what you're thinking right now..."They have got to be kidding! I haven't roller skated in years and even if I did try, I would probably break my neck!" Well, you don't have to skate (if you don't want to). You can watch all the kids go round and round and remember the days when you could do the same. Don and I went a couple of weeks ago and had a blast even though I could hardly stay upright. We thought it might be a really fun way to see some old friends and familiar faces." Bring the kids. Bring the grandkids! Bring your grandparents! 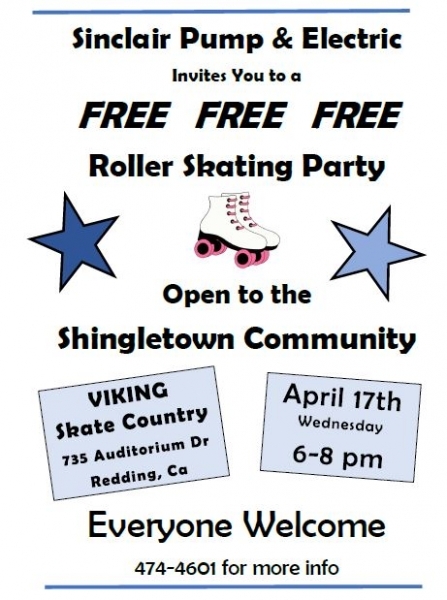 The party is open to the SHINGLETOWN COMMUNITY - the rink is reserved for 150 SKATERS. They have capacity for 900! We're hoping for at least 100. There is plenty of room and lots of parking. So, again: April 17th, Wednesday from 6-8 pm at the Viking Skate Country. Games, prizes, music and FUN! Email, text or call me if you need any more info. Give me a thumbs up if you're coming! Hope to see you there!